Who am I, and what’s this all about? My name is Joojoobees, I blog here about anime especially shows as they are broadcast on Japanese TV. First Anime I Ever Watched: Kimba the White Lion. Where I Was Born: Massachusetts, USA. Why I Like Anime So Much: Anime brings together a number of things I really like, including Art, Music, and Storytelling. I also like several genres that have a prominent place in Anime, especially Science Fiction and Fantasy. For more take a look at my introductory post. Still unsure if you should read my posts here at the Abandoned Factory? What i don’t understood is if truth be told how you are no longer really a lot more well-favored than you might be right now. You’re so intelligent. You realize therefore considerably in relation to this subject, made me personally believe it from a lot of varied angles. Its like women and men don’t seem to be fascinated until it’s one thing to accomplish with Lady gaga! Your individual stuffs nice. Always take care of it up! Hey, I was just wondering. Where did you get the name of ‘Abandoned Factory’? I just happened to write a post likening an abandoned factory to a dead body, as a body is a factory that produces cells, and once the soul leaves, the factory is abandoned, but that seems rather dark for a blog that talks about Chinese cartoons. I covered this in my First Post — I really should revise this page to have more info. Abandoned Factory is a reference to Haibane Renmei. There are two sets of angel-like beings in town, and all the boys live at Abandoned Factory (above a certain age, only girls live at Old Home). Anyways, I see. It just felt a bit strange that I just came up with that whole dead body idea /and/ your site colours happen to be black and green. 🙂 I think I picked the black & green colors because that is what computers looked like when I was younger. I got addicted to the ‘Net back in the ’90s, before the WWW existed. I used to go into the library at my university and use the computers there to play with MUDs and stuff. Nobody knew what the Internet was in those days, so I could sit on there for hours without anyone else asking to use it. Hey man, where did you go? You haven’t updated in a while, and I quite enjoy reading about whatever shows you pick as your taste is top! I was thinking about building a robot to write these reviews for me, but that hasn’t happened yet. I did have a couple of comments I was thinking of making on the new season, so I might start updating again soon. Thanks! That was very kind of you. 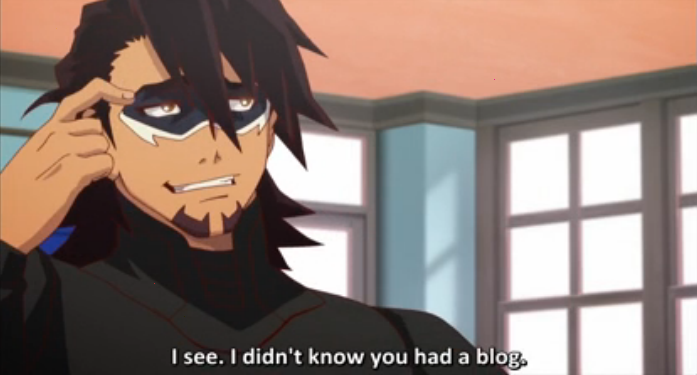 I have really enjoyed your anime blog in the past. This is Cassandra from The Huge Anime Fan. I’m in the process of organizing a blog. Would you be in on this Geekculture blog hop?